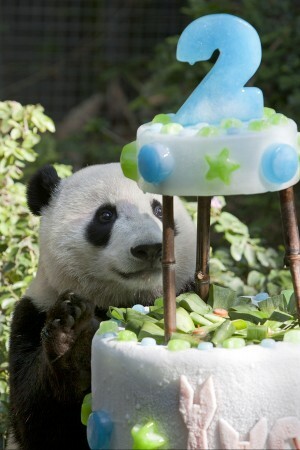 The San Diego Zoo celebrated the 2nd birthday of its youngest panda, Yun Zi, today. The toddler was presented with a 3-tier birthday cake made of ice and bamboo, decorated with bows made out of bamboo leaves, colored pieces of ice, and topped with the number “2.” The base of the cake was drizzled with honey and filled with the giant pandas favorite fruits and vegetables: yams, carrots, and apples. The San Diego Zoo is one of four zoos in the United States with giant pandas. The Zoo began its long-term giant panda conservation partnership with the People’s Republic of China in 1996. Since then, the Zoo has welcomed the birth of five healthy pandas, the most of any zoo in the nation. Happy Birthday to you Yun Zi! You don’t have to be in San Diego to see these beautiful animals up-close. You can watch all of the San Diego Zoo’s giant pandas– Yun Zi, Bai Yun, and Gao Gao– on the Giant Panda cam.